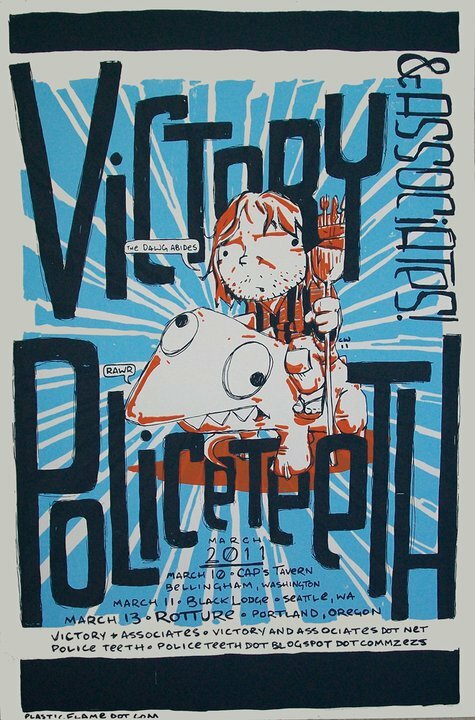 Poster by the incredible Plastic Flame Press and available for sale on tour. Oakland’s The Heavenly States are back in action, joining them are Victory and Associates, and Ready Steady for a special FREE Show at the lovely New Parish. Come to this !!FREE!! show, put on by (((folkYEAH!))) and New Parish, celebrating a first successful year booking amazing music. Come have a drink or two and THRILL to songs from the new Heavenly States record Oui Camera Oui, and the upcoming debut Victory and Associates full length. Over in plenty of time to get to BART and/or get a good night’s sleep. After some ridiculously good times. The fine people at single piece slate have struck again, making vinyl records happen lovingly handcrafted in their shop, I imagine like a fine piece of New England furniture, or like a 7″ Amish collective, working only in the traditional ways of records, ignoring all technological advances…this time they’ve cut a split featuring Victory and Associates and Hurry up Shotgun who were nice enough to send 7Inches one of these clear, thick slabs of vinyl. but then they composed the track to take it one step further, punching in bursts of guitars over mostly bassline, finishing with some over the top Eddie Van Halen soloing. What I can appreciate about these guys beyond the punchy power chords, and frontman Conan Neutron’s (name, perfect) attitude, is that they’re going for broke every time, like Hot Snakes, that massive post-punk energy – the all out party time rock, loud as hell…obviously that’s why they run into trouble with the man trying to bring them down! At the risk of alienating future venues they want you to know they want to rock god dammit! Any band would appreciate this, and should be covered on personal mix tapes and passed around back stage at Bannaroo.